Milk Pickup is a 300 piece jigsaw puzzle designed by artist Bob Fair. The horse drawn dairy truck has just arrived to pickup the farmers milk. Pumpkins and corn stalks decorate this country home in the colourful fall foliage. 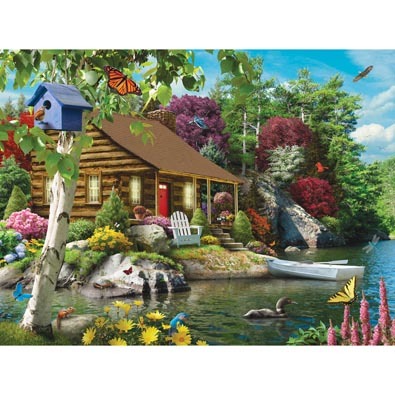 Midnight is a 300 piece jigsaw puzzle designed by artist Alan Giana. A black cat sits in the colourful autumn bushes beside a cluster of pumpkins and a Jack-O-Lantern. Bats fly in the night sky across the full moon. Available in two piece counts. • This puzzle is a great gift for those who enjoy autumn and Halloween. Toy Shop is a 300 piece jigsaw puzzle designed by artist Tracy Hall. Every toy and game imaginable is available at this toy store. The owner discusses with a young boy an action figure he would like to purchase and a girl marvels at a furnished doll house. Available in two piece counts. Snooze Time is a 300 piece jigsaw puzzle designed by artist Tracy Hall. A Labrador and her pups are snuggled up with a cat on a quilt and pillow covered sofa. Available in two piece counts. • This charming puzzle is a great gift for those who like country scenes and pets.